In the small town off Fayetteville, there is an old ghost story. This is the type of ghost story that has passed into legend and come to define the folklore of the region. It is the the story of the Vander Light. I have heard several different versions of this story, but I share the story that was told to me. The Vander Light is a lonely ghost. 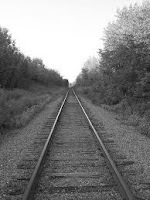 It is a ghost that has been wandering the train tracks since the 1800s. According to legend, years ago a young man named Matthews took a train ride. The young man was a smoker, as was common in those times. He stepped out of the train car and out into the area between the cars to have a smoke. Just as he was lighting his cigarette, the train his a bump and he was thrown from the train. The young man fell at just the wrong angle. His head hit the car and his body was tossed to the ground below the train. He was decapitated on impact. Matthew's head was forever lost to him. It is said that ever since this time, anyone who wanderers along this lonely stretch of train track can catch a glimpse of this young man at night. He walks along the tracks he was killed on carrying a lantern. Those that see him can see him in front of them for only a minute. He appears to be searching for his lost head in the darkness. When the observer gets to close to the young man that has come to be called the Vander Light, he vanishes into the darkness. If you turn around, you can see him standing behind you, watching you and waiting for the parts of himself he has lost in the darkness. There was a time during the great depression when much of America rode the rails looking for something.. I found you a great place to visit full of Australian Yarns and Tales..Scroll down to strange tales for a treat. Sorry it's not an active link,but it should work okay. It's interesting that ghosts would have a mission in the afterlife. You'd think the head would be looking for the body, right? Great post, Jessica. Love that name, the Vander Light! Very creepy! Scared... One version of this story I'ved heard is the head looking for the body and people only see the light. That one does make a little more sense to me too, but I like to go with the versions I hear from actual people before the versions I find online. Jeffrey... Thanks for the link to the Australian Yarns! Good post Jess. What state is Fayetteville in? I know there is Fayetteville Arkansas but it isn't a small town so I was just curious. Lisa... I should have mentioned that. Jeez. Its in North Carolina. There is also the Gurdon Light in Arkansas of a track foreman who was killed by one of his workers. This one was shown on Unsolved Mysteries and can still be seen today. There is a good story about General Bragg falling dead while walking down a street in Galveston, Texas long after the Civil War. It is claimed that a mysterious light has been seen there often.